GTranslate (gtranslate.net) is a translation delivery network that combines machine, crowd and professional translation, and can be used to translate any website. It is similar in design to Smartling and Dakwak, where the customer maps a subdomain (e.g. 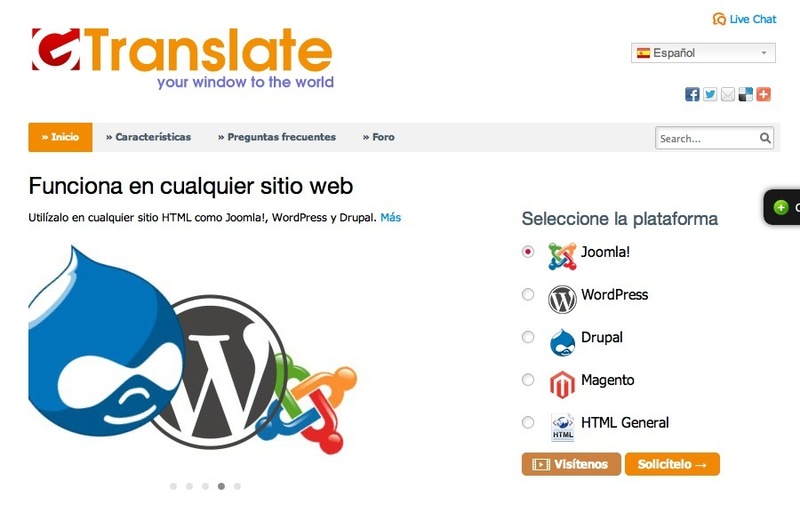 espanol.company.com) to the translation network, which in turn loads source pages from http://www.company.com and replaces the source texts with translations. No software needs to be installed on the server, making this simple and inexpensive to deploy. The company offers two basic tiers of service, a self-hosted version where the site administrator installs some PHP code on the web server, and a hosted version that is completely turnkey, and is hosted by the company. This is an interesting twist because it gives technically astute customers the option of hosting the translation proxy in their data center and storing the translations locally. This is appealing to customers who have concerns about what would happen if the translation service experiences an outage or shuts down. The hosted version of the service is similar to Smartling and Dakwak. In that scenario, the customer creates a subdomain for each target language, and then maps that subdomain to the translation proxy which, in turn, loads and translates content from the original web server or app server. This version can be deployed in minutes, making it attractive for companies that don’t want to or can’t alter their web server environment. GTranslate is targeting small to mid-size companies, and provides a self-service solution that is easy to configure via the web. Smartling, on the other hand, focuses on larger customers and is not really set up to deal with smaller retail customers. If you have a website that needs to be translated, but don’t need a full blown multilingual CMS or e-commerce environment, GTranslate is a good option to consider. Several companies offer service based on translation delivery networks, including Smartling, Motion Point and Dak Wak. This entry was posted in reviews, translation delivery networks and tagged gtranslate, tdn. Bookmark the permalink.